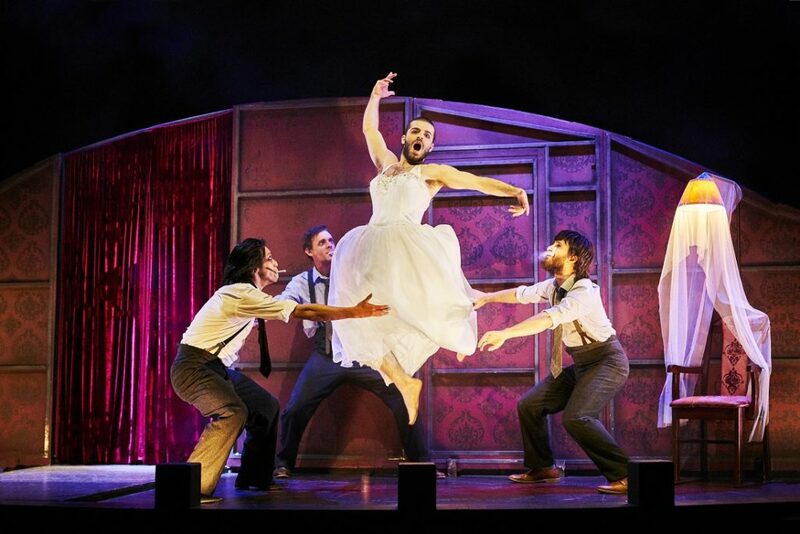 On Friday night I was in Bristol to see Gecko Theatre’s brilliant new production ‘The Wedding’ at the Old Vic studio. It was amazing. It now goes on tour to Watford, Nottingham, Derby, Liverpool, Doncaster, Oxford and Nuffield. It is a truly remarkable piece of physical theatre, in which all the actors speak different languages. It touches deep into questions about our relationship to power, to systems, to each other, and into what it would feel like if we were able to break loose from being “wedded” to the current paradigm. I loved it. I was also asked to write a short article for the programme, given that as the show tours, it is connecting to Transition, or other similar groups in each place it visits. Here is a short video taste of the show, and the piece I wrote. Go see it! “There’s an old Belgian saying, “in the past, even the future was better”. I often wonder whatever happened to the future. When I was a child, we talked about the future a lot. It was going to be amazing. We were going to have our own spaceships, robots in the home, hoverboots. Actually I’m quite glad the whole hoverboots thing never happened. Imagine your commute to work this morning with everyone on hoverboots. Chaos. But we don’t seem to talk about the future anymore. It feels too complex, too scary, too uncertain. And so we ignore it, or we retreat into nostalgia, projecting our hopes into the past, what some call ‘retrotopia’, the increasingly prevalent idea that we should go ‘back’ to the 1950s. But this is the worst possible time to turn our backs on the future. As we face a historically unprecedented onslaught of challenges, it is vital that we can imagine a future other than business-as-usual, because we know that business-as-usual will destroy life on this planet. So the creation of anything else is fundamentally a work of the imagination. Imagination, “that vast and scintillating internal fountain of all things strange and new” as Mike Llewellyn at TED.com described it. In our daily lives there are less and less spaces where imagining the future is encouraged. In school there is a focus on testing from a young age that seems to produce little of use other than chronic stress and anxiety. Universities are increasingly results-driven with declining space for creativity. In our work lives we are usually encouraged to hang our imaginations up on the peg along with our coat when we arrive in the morning. Our home lives? We now spend, on average, 65% of our waking hours in front of screens. The imagination needs space, reflective time, and other people. Without that, we find ourselves living in what, presciently, William Walsh, writing in 1958, described as “an age suffering from the amnesia of the imagination”. Transition is an experiment that started in 2005, based on the question of what a bottom-up response to the challenges of our times might look like. Could we create, we wondered, a community-led movement which felt “more like a party than a protest march”, which held spaces where people came together to imagine the future and how it might be? You’ll now find Transition groups in 50 countries around the world, with both their holding of “what if?” spaces and their translating of the ideas that emerge from those spaces into practical action on the ground. As US prison abolitionist Mariame Kaba puts it, “we have to imagine while we build, always both”. Here are a few examples of the kinds of things Transition groups do. Crystal Palace Transition Town in London created a new food market, which has won several awards, and created the support, and the context, for at least 25 new food businesses to be created. Bath & West Community Energy, which emerged from Transition Bath and Transition Corsham, has now raised over £13 million in community investment from local people for renewable energy across the city. In Liege in Belgium, Liege en Transition’s ‘Ceinture d’Aliment-terre’ project is aiming to create a ‘food belt’ around the city, a web of microfarms connected to the city, creating a wealth of jobs, and a more resilient food sector. The project is growing fast, and was recently adopted into the city council’s plans for the next 20 years. Transition groups have built food gardens in streets or on train stations, started local currency projects and new community-supported farms, crowdfunded to open new breweries and bakeries, brought together local care providers to look at providing care in new ways, become their own housing developers focused on meeting local needs, started cafes using ‘surplus’ food from local shops, run repair cafes and so much more. I could fill every page of this programme with inspiring stories from Transition groups. Have a look at TransitionNetwork.org for some inspiration. ‘The Wedding’ matters because it creates one of those rare imaginative spaces where the future can come into focus. While the prevailing narrative in our culture is that the future is going to be rubbish, there is absolutely no reason why that should be a given. It could be absolutely fantastic. I’ll say that again. The future could be absolutely fantastic. It could be a place where the food is amazing, the conversations are richer, where loneliness is a thing of the past. It could be a place of clean air, cities where food grows everywhere, where art flourishes, where we feel safe and nurtured. It could be a future of 100% renewable energy, with thriving biodiversity. I can’t wait. But it’s a future that starts in places like this, with conversations like this. If you’ve enjoyed your experience here, get involved, and let your imagination run. Let’s do this. Rob Hopkins is the founder of the Transition movement, author of several books including ‘The Transition Handbook’ and ‘The Power of Just Doing Stuff’, a public speaker, blogger and gardener, who is currently working on a new book about imagination. You can find out more at robhopkins.net or transitionnetwork.org.